A very pretty Victorian bedroom fire and original Victorian stripped pine surround. The insert has an arched border around the fire opening with a decorative repeating pattern border. The fire has the original curved front bars, grill and smoke flap with pretty leaf design. The fire has a kite mark on the back, illustrating the items age. The kite mark details have been written on the back of the fire and dates the insert to 19th June 1869. 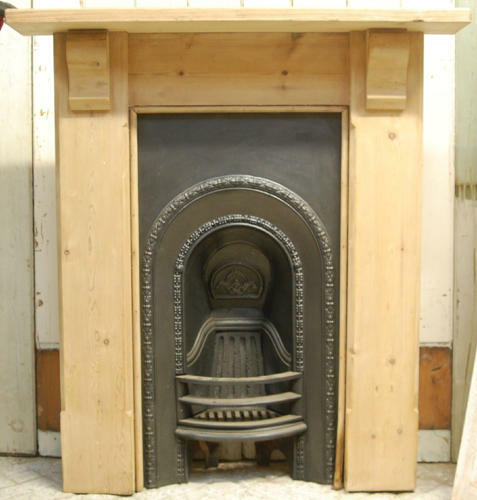 The insert comes with a classic Victorian stripped pine fire surround with mantel and carved corbels. The surround is sturdy and has a nice colour and grain. The fire is an antique and therefore has some signs of use and wear. The surround has some slight damage, with small chips and splits. There is a larger chip to an inner edge. One of the inner molded edges is coming away at the base of the surround. The pine has some signs of wear, marks and scratches. The fire has some heat bulges to the sides near the grill that have caused splits, although the fire is still useable. The insert has some light marks and wear. The back of the insert has surface rust as expected. The fire is ideal for a bedroom or smaller reception room and would add great style to a home. The pine surround can be finished by purchaser as desired, with either a paint, wax or varnish. A pretty and stylish fire.